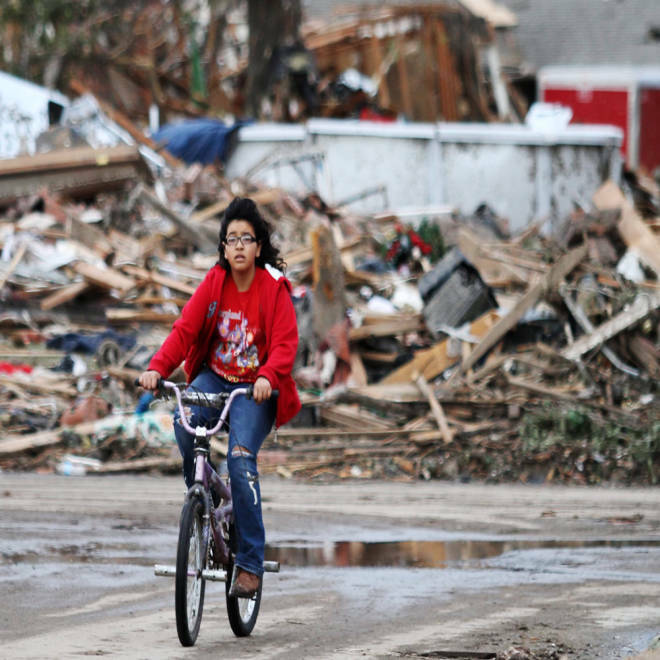 Over the last day and a half, the residents of Moore, Okla., have endured the terror of a devastating tornado and the heartbreak of the storm's aftermath. TODAY's Matt Lauer takes a look back at how it all unfolded. A tornado that devastated Oklahoma City's suburbs has left dozens of people dead, numerous injured and missing and countless homes destroyed. As rescue workers continue to pick through the rubble, hoping to find survivors, here are some accounts from those who did make it out. Rhonda Crosswhite, a teacher in hard-hit Moore, Okla., ushered her students into bathroom stalls as the tornado descended right onto Plaza Towers Elementary School. As she laid on top of the kids, one had a plea: "One of my little boys, he just kept saying, 'I love you, I love you, please don't die with me,'" Crosswhite told TODAY on Tuesday. Rhonda Crosswhite, a teacher at Plaza Towers Elementary School in Moore, Okla., describes covering her students with her body to protect them from the tornado that devastated the school. Every one of Crosswhite's students made it out, she said. One had a head cut, but everyone else was totally fine — other than Crosswhite, who has cuts all over her body and feet. "I never thought I was going to die," she said, "The whole time, I just kept screaming to them, 'Quit worrying, we're fine, we're fine, we're fine,' and I'm very loud. I just kept hoping they could hear me because I could hear them screaming." Crosswhite said she said a few prayers as the powerful tornado blew over them. "It was like a freight train," she said. "It felt like someone was beating me from behind." One of Rhonda Crosswhite's students who endured the chaos was fourth-grader Damian Britton, who survived by hiding out in the bathroom of Plaza Towers Elementary School. "A teacher took cover of us. Miss Crosswhite," Damian told TODAY on Tuesday. "She was covering me and my friend Zachary. I told her that we were fine because we were holding onto something. And then she went over to my friend Antonio and covered him. So she saved our lives." Brandi Kline and her two sons, both students at Plaza Towers Elementary in Moore, Okla., which was directly hit by the tornado Monday afternoon, recount their experiences, as Damian Britton says his teacher threw her body over him and his classmates to shield them from the storm. After the storm blew through the school, "it was just a disaster," Damian said. Cars were strewn all over the property; the odor of gas wafted through the air. Damian survived without a scratch, but half of his home was destroyed, his mom, Brandi Kline said. "All of our neighbors lost everything," she said. "As long as I have my kids, that's all that matters." Newcastle, Okla., KFC cook Michael Welch got distracted during his shift on Monday by the sound of hail pounding the parking lot. Armed with his cellphone, the 24-year-old went outside, where he saw the wall cloud of a gigantic tornado rotating in front of him. Instead of going inside to take shelter, like most of his coworkers decided to do, he ran into the parking lot and filmed the twister with his phone. “Probably not the best thing to do, but I did it,” he said. His video, seen now by hundreds of thousands on YouTube and on NBCNews.com, gives a street-level view of the funnel cloud that plowed through Newcastle and Moore. For one resident of Moore, surviving the twister was a terrifying experience, especially after it tore off the door of the cellar he was sheltering in. "We thought we died because we were inside the cellar. We locked the cellar door once we saw it coming. It got louder and next thing you know, you see the latch coming undone, and it ripped open the door," Ricky Stover said, his voice breaking as he held back tears. A survivor of the deadly Moore, Okla., tornado recounts how the storm ripped open his locked cellar door. "Glass and debris started slamming on us, so we thought we were dead," he added. Charles and Sandra Marsh have lived in the same subdivision in Moore since 1978. Since then, they have seen three tornadoes barrel through, including Monday's and 1999's EF-5 twister. Before Monday's came through at 2:30 p.m. local time, the Marshes decided to drive to Norman, just south of Moore, to wait out the storm in a shopping mall, not knowing what they would come home to — if anything. When they came home, they discovered their house was one of the few still standing in the subdivision. "My ex- son-in-law and ex- father-in-law lost their houses. They lost everything," Charles Marsh said. "We were lucky." The house had a little damage in the back, but the Marshes slept there Monday night, huddling under a blanket for warmth. "I think the structure is sound," Charles Marsh said. "It's livable." Down the road, their children's former school got blown away. The Marshes still hadn't heard from their friends as of Tuesday to confirm that they were alright, but Charles Marsh said he was grateful that his family was fine. "My kids — they're all OK," he said, tears in his eyes. 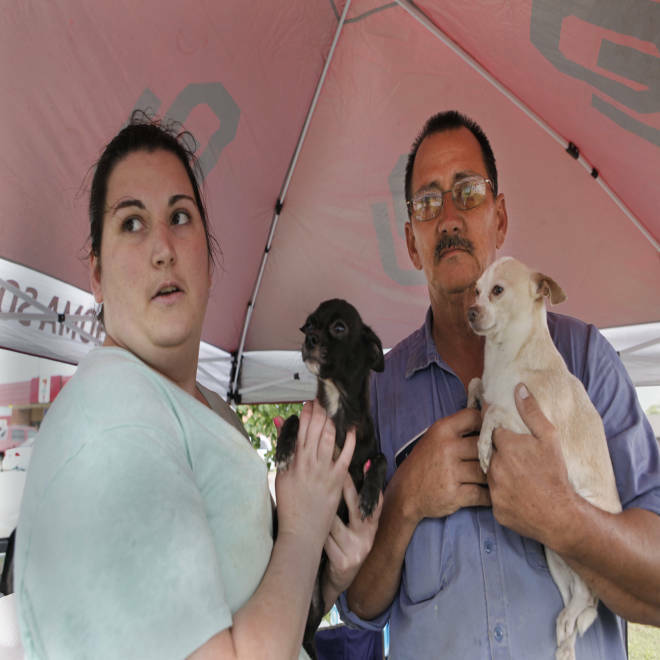 After the tornado flattened their home in Moore, two members of the Hendricks household were still missing: Lola and Louie, a pair of chihuahuas. The family's two other dogs had been found under a pile of debris in the backyard after the tornado, but Lola and Louie were nowhere to be found until Tuesday morning. That was when Levi Hendricks came back to the rubble that used to be his house and heard the faint sound of dogs whining. Leslie Hendricks, 27 and her father Levi Hendricks Sr., 53 rescued their dogs from the rubble of their house in Moore, Oklahoma after a massive tornado touched down there yesterday. Hendricks and his two sons started digging, and reached Louie, 3, and Lola, 2, who were both fine. Oklahoma Highway Patrol trooper Betsy Randolph arrived in Moore on Monday after the afternoon tornado hit to help victims, and told The Oklahoman the devastation was "the worst thing I have ever seen." She urged people to stay away from the area, which was being kept clear for emergency responders. Melanie Shelton, a Moore resident, barely made it out of her apartment complex as the tornado chased her and her son-in-law down the road on Monday. "Behind us, you could just see it," she told CBS Oklahoma affiliate news9.com. "It just looked like bombs had been ignited everywhere. There's car parts in my bedroom. Everything's gone. Just in a matter of 30 minutes, your whole life is gone." She had been alone in her apartment in Moore when her son-in-law came frantically knocking on the door just before the tornado hit and urged her to leave. The two of them "booked it to Norman," a 10-mile drive south from Moore. "If I would have stayed, I may not have been here," Shelton told news9.com. NBC News' Miranda Leitsinger and NBC News contributor Alex Hannaford contributed to this report.